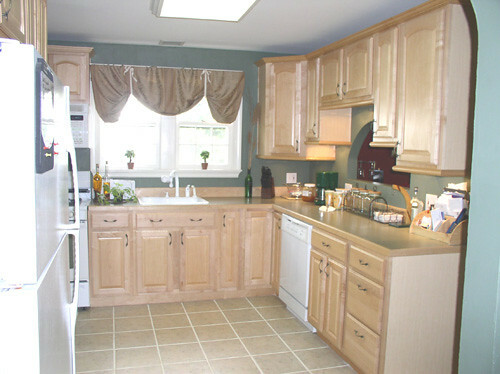 This kitchen had good “bones!” The area was there, it just needed some rearranging. Relocating a doorway from the remaining to the right side of the wall designed all the big difference. The stove was relocated to an outdoors wall and to improve the use of area a microwave/hood was made use of for ventilation. The sink remained centered to the home windows and a dishwasher could now be integrated into the style. The kitchen received 9 feet of un-interrupted counter leading area and the use of a utility cabinet up coming to the fridge not only delivered a incredible amount of storage but provided a tailor made developed-in look. A pass-by was designed previously mentioned the lengthy countertop to supply a ornamental and purposeful element to the home. The ground was tiled and the walls had been textured and painted. The imaginative use of paint, an arched pattern, in the “nook” gave the area an open up feel.